​Part of the Growler Relay adventure is knowing and navigating your leg of the course. Course legs are not marked with physical arrows or signage. Why? Course markings can be moved or stolen. Not cool for anyone. Course markings clutter up communities. Growler routes vary from 40-70 miles and that's a lot of signage. Course marking isn't a sustainable practice. For the environment or for us keeping these events reasonably priced across the country. 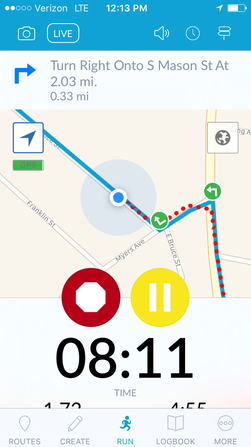 Live tracking routes on the map in real time (e.g., the blue dot following the prescribed route's blue line). Accessible and user-friendly web/mobile platforms. RunGo does it all. We've tested the tool in multiple settings and the mobile app leads you by voice or visual navigation perfectly from point A to point B. You are highly encouraged to practice using the app before race day. Just to be clear: you are required to either utilize the RunGo app to navigate your route OR provide your own turn sheet on the day of the event. We highly recommend using the RunGo app with headphones.